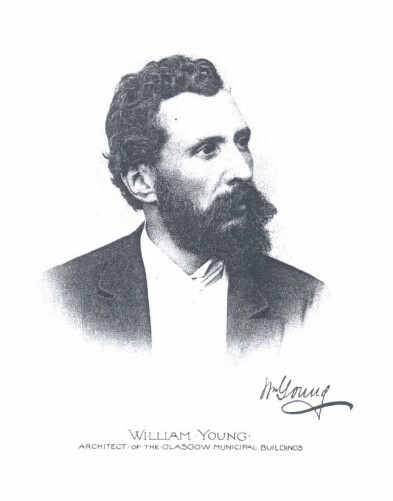 Bio Notes: William Young was born in Paisley in 1843 (christened 25 March), the son of James Young, bootmaker and spirit dealer, and his wife Helen Nisbet. About 1857 he was articled to James Jamieson Lamb of Paisley, but in 1859 he moved to the office of William Nairne Tait in Glasgow. Although not included in his RIBA nomination paper a well-informed articled in 'The Bailie' records that he spent some time with Salmon Son & Ritchie and a period in Manchester before settling in London in 1865 as assistant to Charles Henry Howell, the Surrey County Surveyor. This enabled him to study at the South Kensington Schools prior to commencing independent practice in 1869. In the same year he produced 'Picturesque Examples of Old English Churches and Cottages from Sketches in Sussex and the Adjoining Counties', published in Birmingham in 1869. This book brought him to the attention of Lord Elcho who found him 'living in chambers in Exeter Hall, a young unknown architect without even a draughtsman'. In the following year he was commissioned by Elcho to put up the National Rifle Brigade's timber marquee at Wimbledon Common which had a floor area of 50,000 square feet, and in 1873 Elcho's brother-in-law, William Wells MP, commissioned a large country house from him. Thereafter the recommendations of Elcho and Wells brought a steady stream of up-market house work culminating in Chelsea House, Cadogan Place for Earl Cadogan for which he made a study tour of Florence, Venice and Rome. It established his reputation in London, John McKean Brydon observing of him that 'No man knew more the requirements of the great country house, or how more effectively to carry them out'. Young's practice was heavily backed up by a continuing programme of publishing. In 1872 he brought out 'Picturesque Architectural Studies and Practical Designs for Gate Lodges, Cottages, Cottage Hospitals etc' . It would appear that Young had formed a partnership about this time as a number of the plates in this book were by Shaw & Young architects or R M Shaw & W Young. It is as yet unclear how long this partnership lasted. 'Picturesque Architectural Studies' were followed by 'Town and Country Mansions with Notes on the Sanitary and Artistic Construction of Houses', 1878, and 'Town and Country Mansions and Suburban Houses', 1873, all of which were published in London and New York. These form a record of his earlier practice. In parallel with these he became the founder editor of E & F N Spon's long-running 'Architects and Builders Pocket Book' in 1873. In 1877 Young attempted to establish himself as an architect of major public buildings, by entering the competition for Liverpool Stock Exchange in which according to 'The Bailie' (but not Harper) he was placed second. In June 1881, with the encouragement of Lord Elcho, Young entered the second Glasgow Municipal Buildings competition with a well-judged entry which improved upon but did not radically depart from Carrick's outline plans. He reached the second tier of the competition in January 1882 and was placed first by the assessors in June. He was unplaced in the competition for South Kensington Museum in 1891 but through the influence of Elcho, from 1883 the 10th Earl of Wemyss, he was given the commission for the new War Office in Whitehall without competition. Young was admitted FRIBA on 12 January 1891, his proposers being Brydon, Howell and Charles Barry Junior. He died suddenly of pneumonia on 1 November 1900 at his home, Ingleside, 23 Oakhill Road, Putney and was buried at Putneyvale Cemetery. At the time of his death he had been working on extensive alterations and additions to Elveden Hall, Suffolk, the English seat of the first Viscount Iveagh, of whom he was the favoured architect, and for whom he had also made alterations to Farmleigh, County Dublin and designed a ballroom and other additions at Iveagh House, Dublin. The work at Elveden Hall was completed and the practice continued after his death by his son Clyde Francis Young, born 1871, who had been taken into partnership in 1898 and retained the editorship of Spon's 'Practical Builders Pocket Book' and the 'Architects and Builders Price Book' as the original publication had become. Clyde had attended classes at South Kensington in 1889 prior to being articled to his father in 1890-94, during which period he had taken the courses at University College, London. He had travelled in France and Belgium, studying for a time at Lille, and then spent six months in Italy. He passed the qualifying exam in 1900 and was admitted ARIBA on 3 December, his proposers being John McKean Brydon, Thomas Drew and Edward William Mountford. He became a Fellow on 5 December 1910, his proposers being Thomas Edward Collcutt, Sir Aston Webb, and Sir John Taylor. His practice was a similar mix of major public buildings and country house work. He died on 4 May 1948, the practice being continued by his partner Bernard Engle. New Municipal Buildings, George Square, Glasgow, Scotland Business 1888 Branch office? 1881 Glasgow Municipal Buildings Glasgow Scotland Competition design (first competition) submitted under the pseudonym Clyde and under the pseudonym Viola in second competition. Won second competion to secure job.